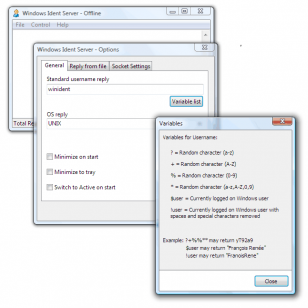 Windows Ident Server is a stable, easy-to-setup IDENT server for Windows. The IDENT protocol is used primarily within FTP and IRC networks as an authentication method. Windows Ident Server handles IPv6 connections. Also, Windows Ident Server can be installed as a service. Includes support for rndware psyBNC Server. Windows Ident Server is compatible with Windows XP, 2003, Vista, Server 2008. Windows Ident Server is not compatible with Windows 2000 or earlier. IDENT server for FTP, IRC and more. Get IDENT reply by currently logged on user. Direct Link: Windows Ident Server 2.0. "I use it on Vista and can confirm that it runs both as an application in your systray (handy! ), or as a system service (doubly handy!)"